This is a trick photo–He doesn’t actually smile yet. I caught him dreaming today and making all kinds of silly faces and his eyes were open. This picture will be cute on our birth announcements! This entry was posted on February 23, 2008 at 4:22 pm	and is filed under about me, baby, etsy, family, home, Home Life, infant, oscar, printmakerjenn, Printmakerjenn -- Etsy, zne. You can follow any responses to this entry through the RSS 2.0 feed. You can leave a response, or trackback from your own site. Congratulations, Jennifer! Oscar is gorgeous. 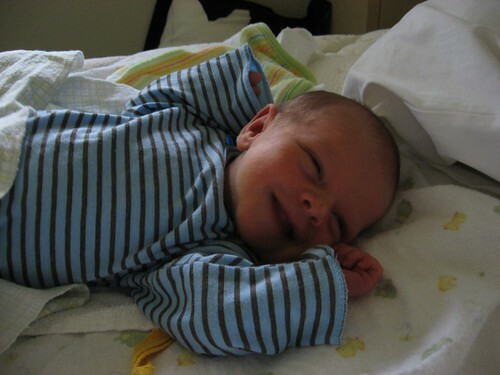 My own son’s name is Otto, so I am very partial to O names…”Sleep grins” are one of the most revered parts of babydom, in my opinon. All of a sudden it disappears at 8 weeks or so and you mourn it–you’ll be so glad you got these photos. Strange series of events (Flickr,daxiang stef, looking for a pepper shot for my blog entry today…) brought me to you there (I neglect my Flickr account woefully), then here. Look at that smile! What a cutie! Congratulations!